AutoDesk Store, online at Store.Autodesk.com, offers the internationally recognized design software used by professionals around the world. Design in 2D or 3D with AutoCAD software, suited for either your Mac or PC. AutoCAD and Autodesk Inventor are used by the building and construction, manufacturing, infrastructure, and entertainment industries. AutoDesk Store is for engineers, designers, architects, and many others who want to share data easily, want the tools necessary for production, and explore creative solutions. Find the best AutoDesk Store coupon codes, AutoDesk Store promotions, and Store.Autodesk.com discounts here at RetailSteal.com. Shipping rates at Autodesk store depend on method of delivery and whether or not you download your software. See website for more details. Enjoy a 30 day free Autodesk Maya trial from the Autodesk store when you use this click on this promo link. Download Free AutoCAD Architecture 2013 free for 30 days from AutoDesk Store. Click link to try today! Click link to check out the latest and greatest promotions and offers from AutoDesk Store online. 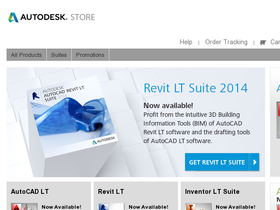 Click link to save $150 off Autodesk Inventor LT 2013 software.